I’m delighted to announce that I can now show you the Cover Reveal for my new Luminarie edition of Mystical Circles! It’s been a long and sometimes fraught journey with the cover designers but I’m very excited with the final result! So without more ado here is the book cover for Mystical Circles. The new Luminarie edition of Mystical Circles is available as from 5 September 2017. It will be available online and in all good bookstores. And I am doing a special promotion for a limited period for UK readers of this blog. Copies of the paperback can be pre-ordered direct from me via the Contact Me section of this blog, at 20% discount from the RRP of £8.99, and free of p& p. There will be 10 copies of the book available through this promotion to the first 10 purchasers, and all I ask is that you post your review on Amazon as soon as you’ve read the book! Posted on January 10, 2017 January 11, 2017 CategoriesAbout Books I love, book reviews, Books, creative writing, literature, love, musings, SC Skillman, thoughts, WritingTagsbook club, books, Goodreads, literary, reader, reviews, SC Skillman, writers12 Comments on How Many Books Do You Read in a Year? Recently I thought it would be fun and interesting to ask this question of fellow-writers on our own dedicated Facebook group, having just learned from Goodreads that I’d reviewed or rated 28 books this year. The answers I received from fellow-writers took me by surprise: and not least, because I was humbled and impressed by how the majority of these individuals managed to fit in so much reading alongside writing their own books! I love to read a book which is a totally absorbing page-turner, a book which you can’t wait to get back to. It’s one of life’s greatest joys. I’ve just finished reading The Essex Serpent by Sarah Perry and I found it a real struggle to read, it’s so slow-paced and (I think) self-consciously literary. I bought it in Waterstones, attracted by the beautiful cover and the interesting blurb. I was determined to persist with it to the end because I’d spent good money on it but felt cheated of that wonderful “must get back to it as soon as possible” feeling with a good book. What do you think? Do you know how many books you read in a year? And what’s your view of “fast” and “slow” readers? Does it matter? and does it impact upon the quality of your response to the story, or your reviews, if you do review books (or discuss them at a book club). I’d love to have your comments! 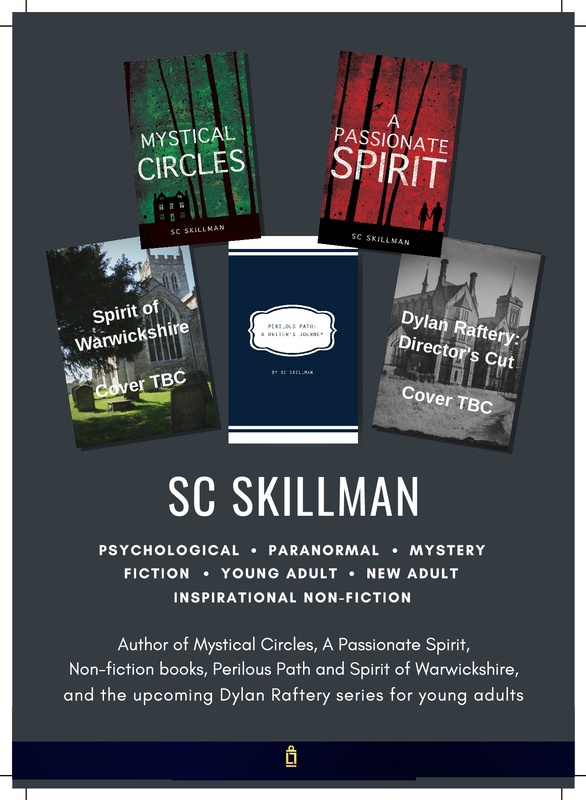 at I enjoyed selling and promoting signed copies of my two thriller suspense novels Mystical Circles and A Passionate Spirit and meeting readers at King Edward VI School Christmas Fair, Stratford-upon-Avon last Saturday. A pianist and choir entertained us with carols, the prefects carried our bags from the car and brought us tea and coffee during the fair, and there was also a fabulous raffle with wonderful prizes like an overnight stay and dinner and wine for two at the Lygon Arms, Broadway… very appropriate for the fact that the final scene of A Passionate Spirit is set in in the Lygon Arms, Broadway. Sadly though I didn’t win the prize! I chatted with readers and one of them said “This looks just the sort of thing for me for January reading…” also I found once again that men seem to be the first to take initiative in browsing and then buying my books, even persuading their wives to buy them! What is this saying about my target audience?.. We’ve heard it said before but it always stays true – books make an ideal Christmas present… if, of course, you know the reading taste of your gift recipient! Happy reading over Christmas and into the New Year. A couple of years after I left university, whilst on a spiritual search, I went to a lecture at the Royal Overseas League in London, met, chatted to and became captivated by an inspirational speaker: a Physics professor who wrote spiritual books. His name was Dr Raynor Johnson. Subsequently I read and loved all his books, beginning with his latest: “A Pool of Reflection”. I later wrote him a letter, to which he responded with a very kind and encouraging reply from his home at Santiniketan, Ferny Creek, Melbourne Australia. Santiniketan later became notorious as the first premises Raynor Johnson made available for the use of the then beautiful and charismatic Anne Hamilton-Byrne, the cult leader, and where she gave her spiritual talks, and started to gather her followers. At the time, of course, I had no knowledge of this. I wrote about him and about the cult with which his name has now become ineradicably linked in this blog post: The Curious Case of the Kindly Professor and the Cunning Cult Leader. I also used the story of the cult in my novel A Passionate Spirit (pub. Matador 2015). This cult is particularly relevant to my interests in writing A Passionate Spirit, because of the way in which the cult leader uses beauty and charisma to win devoted followers, whom she then indoctrinates with her teachings; and the cult preys upon the young and the vulnerable. In addition the cult won the support of many intellectuals and people occupying high professional positions. It is a case which is of vital fascination to a writer of psychological thrillers and suspense. Later I was contacted by journalist Chris Johnston, who has published articles about the cult in The Age, Melbourne and in the Sydney Morning Herald. He wanted to make reference to my experiences, and to quote from my blog post, in a book he was writing about the cult. You can watch the story of this cult on BBC TV tonight Tuesday 29 November 2016 in a documentary called: “Storyville: The Cult That Stole Children.” It is being broadcast at 9pm. M paranormal thriller novel A Passionate Spirit inspired these remarks from a Net Galley reviewer, CE Gray: “as Natasha and James started to take hold of both the centre, and the people within it, the story picked up pace and for me became a page turner. I needed to know, were there supernatural forces at work? Was Zoe imagining it? Were Natasha and James just fraudsters? Was this a story about a cult? A Passionate Spirit is available to buy online and in bookshops.